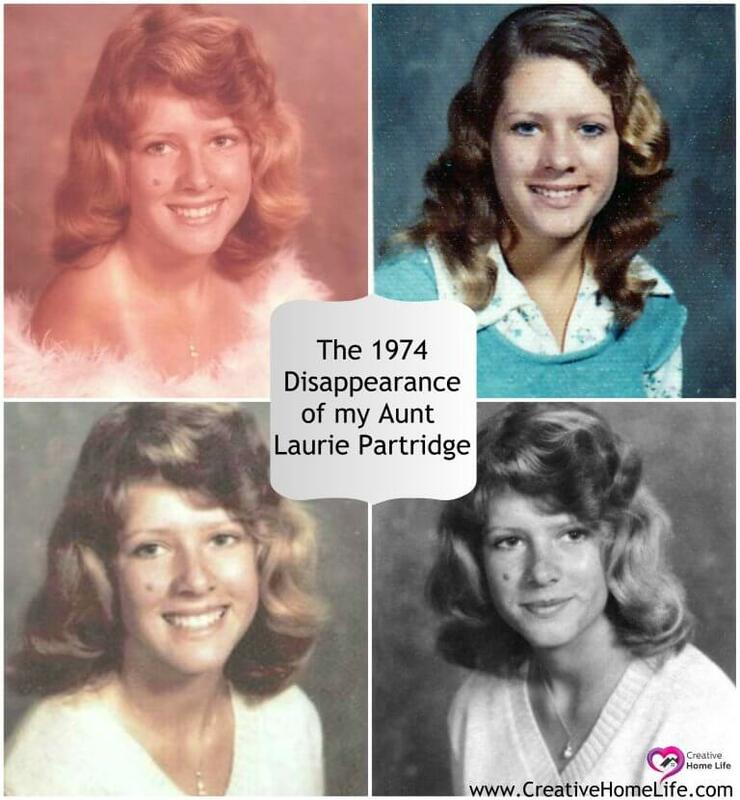 Today marks 44 years since the disappearance of Laurie Partridge from Spokane, Washington on Dec. 4, 1974. If you know me personally you know I’m a volunteer advocate for missing people and their families and you likely know my Aunt’s story. My Mother Kimberly, comes from a family of six kids she is the 4th Partridge kid. The oldest being her sister Laurie Partridge, her birth name was actually Laura but everyone knows her as Laurie, a name she chose to go by (not many people know this about her). I never got to meet my Aunt Laurie, as my Mom was 10-years-old when her sister went missing. Growing up, my mother would talk to my brothers and I about Laurie’s abduction, it was very difficult back then for Mom to talk about, and it still is today she still can’t talk about her without crying. It is difficult for all the surviving family members to talk about. My Granny died in 2004, never finding out what happened or getting answers for what happened to her beloved oldest daughter. My Grandpa is alive at 91 years old, he has waited all these years for answers. With hope to someday find justice for his daughter, holding the perpetrator accountable providing they are still alive and give his daughter a proper burial, it’s what we all want. Some people have asked us how we can say we know she is deceased, without knowing for sure? She has never been found, nor her body or bones, no confessions, no trace. How can we say that?? We have no other choice but to believe that. Laurie would not have run away, her family knows this and its unlikely that she has been held captive for over 40 years. Until her remains are found and/ or someone comes forward, Laurie’s remaining living family lives in a painful unknowing emotional limbo. Another thing we have been told is we should “just put this behind us”, “she has been missing this long, why can’t we just forget about her and let it be?” Some people just won’t understand what its like to have a missing loved one unless they are in your shoes, and its a pain you would not want to wish on anyone… Also, some people are just plain insensitive. Most family of the missing cannot just “move on”. Laurie personally was a caring person, she would never have stopped looking if it was another family member who went missing. She is valuable we cannot give up hope that someday justice will prevail. Being an advocate I have heard of these type of things being said to other families as well. My friend Robin, who’s mother Cloudia Leslie Wells is also missing, I work with her along with a team of volunteers at “Missing & Homeless” has been told “maybe she doesn’t want to be found” it infuriates her. Laurie Lynn Partridge was born May 31, 1957 in Santa Monica, California she would be 61 years old. She was only 17 when she went missing. My Mom’s family moved from Fountain Valley, California to Spokane, Washington in 1974. 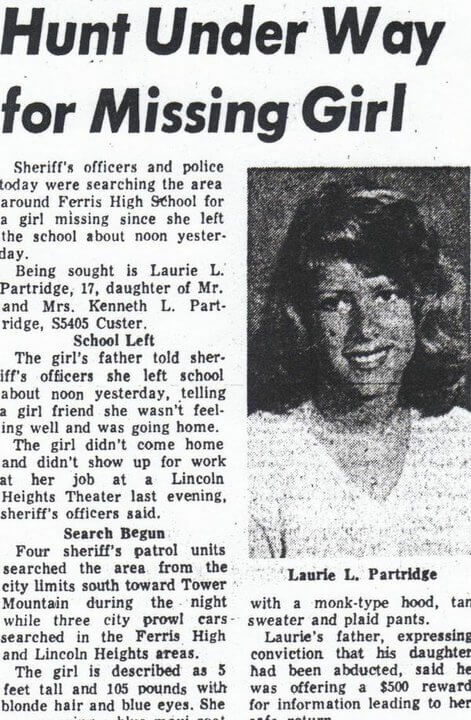 Laurie was a member of the drill team and wrote for the school newspaper. She had many friends and a 20-year-old fiancé, they had plans to live on his families farm, care for animals and have many children, they both loved children. Laurie loved Jesus and enjoyed singing and playing her guitar she was known to play and sing for her younger siblings and neighborhood kids. My Mom has Laurie’s songbook, that Laurie had put together with her favorite songs she loved to play. As a child, I remember looking through Laurie’s songbook and, imagining what she was like. Laurie and her fiancé were very excited about their engagement and planned on picking out engagement rings on December 5th, but she went missing December 4th. 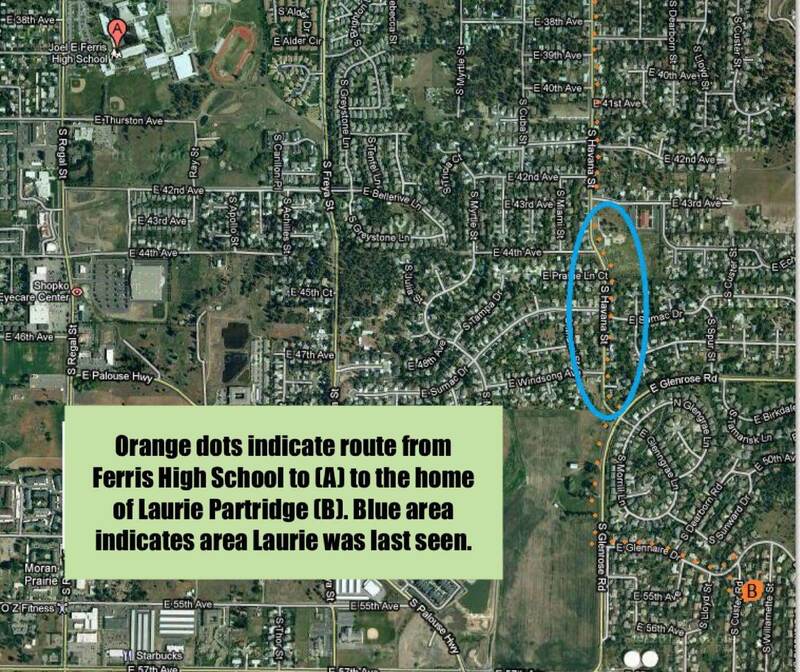 Laurie left Joel E. Ferris High School about 12:30 p.m. She had cramps and wanted to leave early. She called both her Mom and Dad who were each working and could not leave, they told her to stay and wait for the bus. With no one available to give her a ride, she decided to walk the two-plus miles home in the 5400 block of S. Custer Road, thinking it might ease her cramps. 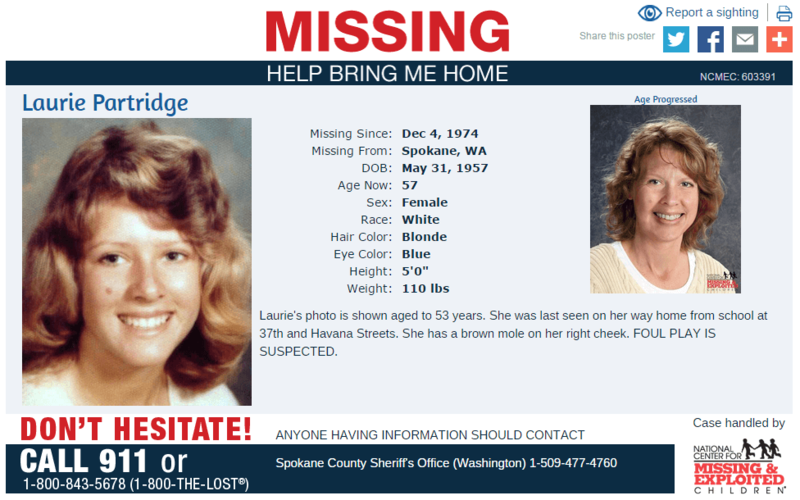 Laurie was reported missing after she failed to show up at home or for work that night at Lincoln Heights Theater. She was last seen by a neighbor walking South on Havana St. between 43rd and 49th Avenues. The police initially and wrongly classified her disappearance as a runaway, even though her family insisted she would never run away. After she was reported missing Laurie’s father and second oldest child walked the route she would have walked to get home. They knocked on every neighbor’s door and spoke to anyone along the route that answered their door, or who they came across. They were able to build a timeline where Laurie was and the approx time she disappeared based on accounts of people who saw her walking by. Laurie’s Dad had purchased two tickets to the Beach Boy’s Concert for her, the concert was scheduled for December 9, 1974 at the Spokane Coliseum. These tickets were in her purse at the time of her abduction. Laurie’s family begged for permission to check the ticket numbers of people coming in (her mom had the numbers written down). Police refused to let them, as they said it would hold up people getting into the concert. However, police did show up and “looked around” for Laurie. Later it was discovered that the tickets were used, because they were general seating and all tickets came in… But authorities were unable to determine who used them. It was the biggest lead they had. Police and family also spoke to a witness who came forward in 1974. A teenage girl that was riding her horse around 4:15PM and spotted a man in his 40s-50s in a field holding a rifle standing with a girl who she thought looked like Laurie and she described the clothes as to what Laurie wore. They were standing in front of a vehicle described as a white truck with a van backend and a darker colored door. When the witness looked back the girl was no longer visible. This sighting was near the route Laurie last walked. When the witness arrived home, she told her mom what she saw, later that night they saw Laurie’s story on the local news, and contacted police. Nothing came of it. Police also received reports about a Green Ford Pinto station wagon in the area possibly following Laurie and days later someone also contacted police and made a report that they believe they spotted the missing 17-year-old being held captive in the back of a pinto, these leads never went anywhere either. There were a couple other tips that Laurie’s Dad and fiancé followed up on, including them driving to Idaho. Again nothing viable was found. Laurie was very much loved by her family and when she was abducted it tore her family apart. Family DNA has been submitted by multiple family members to build a genetic profile in hope of identifying her if her remains are found. Several potential suspects were questioned by detectives; including serial killers Ted Bundy and Stanley Bernson. Hundreds of interviews and polygraphs were conducted, all were determined unsubstantiated. Bundy was determined to be in Utah at the time of her disappearance from his credit card receipts. Stanley Bernson was a traveling produce salesman who lived in Spokane and had a route close to where Laurie was abducted. My mom requested several times over the years to have detectives question him again, as he is still in prison for the abduction and murders of young women and suspected of killing several more. In July of this year, 2018 the detective on Laurie’s case drove out to Walla Walla where Bernson is incarcerated and questioned him again. He denied having any involvement in her disappearance. Her ex-boyfriend and fiancé were also extensively questioned, her fiance was never considered a suspect. Laurie had a brown mole on her right cheek. The clothing, she was described as wearing was a long, navy blue coat with a hood. A tan v-neck sweater and burgundy/tan plaid pants. Her shoes were faded blue oxford denim with a crepe sole. She carried a brown leather purse with a blue flower design and a braided shoulder strap. There is information on the internet and elsewhere stating that the contents of Laurie’s purse were found 2 days after her abduction. This is NOT TRUE, her purse or the contents of her purse were NEVER found, her family has verified this with detectives. Last seen: Last seen walking home from school at 37th & Havana Streets on Spokane’s South Hill. Laurie (bottom right) pictured with her 5 younger siblings. 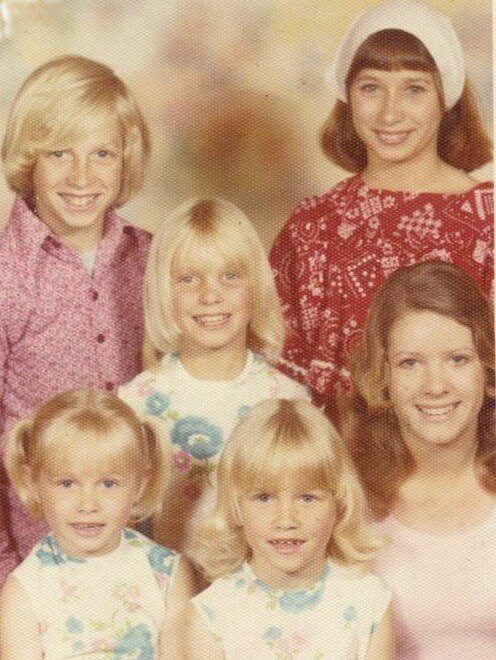 My Mom is the blonde in the center. If you are on Facebook, please click here and “Like” Laurie’s page you can also Follow Creative Home Life on Facebook. Please feel free to message me or leave a comment.